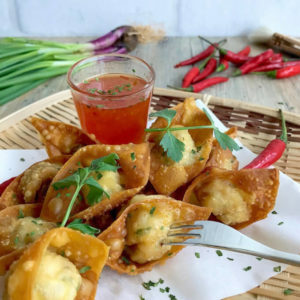 Crispy Wonton with Thai Sweet Chilli Sauce: Dig into this decadent golden crispy treat served with Thai Sweet Chilli Sauce for that burst of juicy, crispy, sweet and savoury flavours with each bite! Serve with Hong kong noodles or simply on its own! 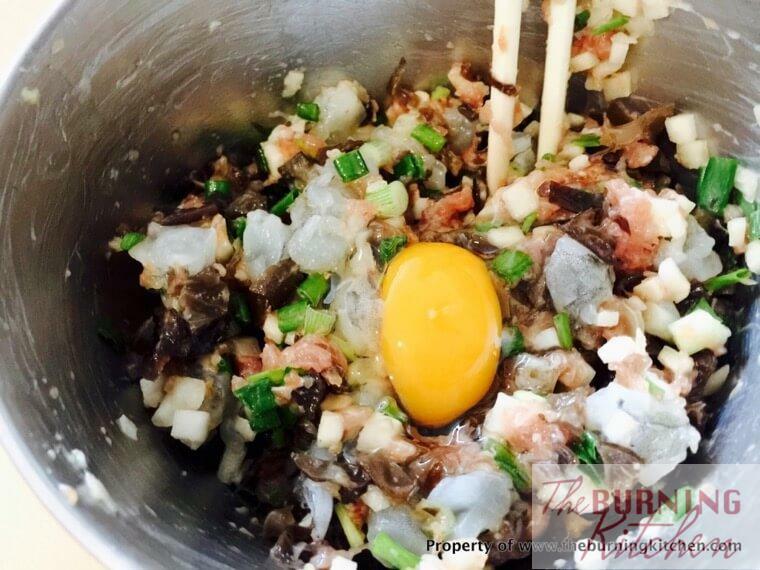 Use the back of a small spoon to coat 2 adjacent sides of the wonton skin with a thin layer of beaten egg mixture. 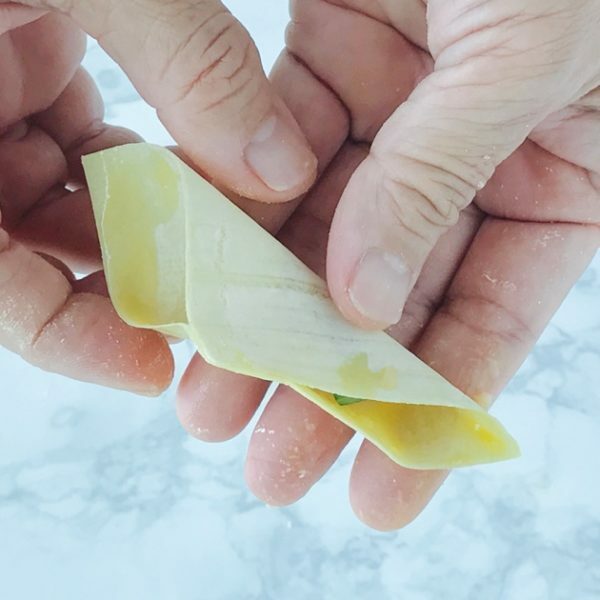 Fold the wonton skin into half to form a triangle, ensuring that all 3 pointed edges are properly aligned. Gently press out any air bubbles from inside out before sealing the wonton skin well along the edges. For instructions on how to fold the gold ingot wonton, you can watch our youtube video, or if you prefer, simply read on. (Optional for Gold Ingot Shape Wonton) Coat the 2 corners of the triangular wonton with egg. (Optional for Gold Ingot Shape Wonton) Gently push the 2 corners towards each other. (Optional for Gold Ingot Shape Wonton) Then seal the 2 corners together into gold ingot shape. Place the wonton on a floured plate in a single layer, without touching each other. In a wok, heat up the oil over medium high fire. Once the oil is heated, add in the wonton in small batches (3-4 at a time). After about 1 minute or when the wonton skin starts to brown, turn the heat down to medium low and fry for a further 1 1/2 - 2 minutes. Remove the wonton and place on a plate lined with kitchen towel to soak up excess oil. Continue frying the wonton in small batches until it is all used up. Place the crispy wonton on a serving dish. Garnish with chopped and/or whole parsley and serve how with Thai Sweet Chilli Sauce. Be sure to press out the air pockets before sealing the wonton, otherwise the air pockets will expand during cooking and cause the wonton to burst open. The cooking time for the wonton depends on how much stuffing is added to each wonton. Once the wonton starts to brown, it is important to turn down the heat to allow the meat stuffing to cook through while ensuring the wonton skin does not get burnt. Similarly, do not add too much meat filling - 1 tsp is just right. Otherwise you will end up with partially cooked meat stuffing and/or burnt wonton skin!